You just haven't wrapped your head around how to save and load data and the official product manual drives you nuts, so you're looking for a little help. You want to load new programs/combis/songs/drum patterns/samples, etc. into your M3, either from free downloads that you've found or from a 3rd-party sound set that you've purchased, but you're afraid of overwriting something important because you're still uncertain about how the data in the M3 is laid out. You're not entirely sure how to load a program, combi, or drum kit from external media into some different location than where they were originally saved from, or even how to tell what bank or slot they'll go into by default. You're looking at a PCG file or SNG file or KSC or KEP file on your external media and aren't sure what these file types contain or do. You're wondering why a given program or drum kit stopped sounding right. You're wondering why the songs or samples you spent 12 hours working on last night are no where to be found when you turned on your M3 this morning. You're wondering why the drum patterns you've created over the past months suddenly disappeared after you loaded up that cool new sound set for the M3 that you just bought. There are a confusing variety of different Save… commands in MEDIA section that all save different combinations of different types of data to external media. Some of these methods of saving data to external media can make it difficult to load the data back successfully unless you know exactly what you are doing. There are a confusing variety of ways to load things from media into the M3, and some of them can load things you don't really want to load, without even making you aware of what's being loaded. Combis rely on the programs that they use being in a specific bank and a specific slot within that bank. If the program is moved to a different bank BUT stays in the same relative slot, there's an easy command in the GLOBAL mode to fix the program assignments in the combi. However, if the program is moved to a different slot, either within the same bank or when moved to a different bank, then you must manually edit the combi to point to the program's new slot (and bank). Even worse, the command that fixes the program assignments can get you in trouble in some scenarios, particularly when first installing 3rd-party sound sets. Sequences (songs) and sampling data that you create are stored in volatile system RAM and completely disappear when you turn off the M3, so this information must be saved to external media first, or it's lost forever. It must also be manually reloaded every time you turn on the M3 and want to work with that information again. Some types of data that are used by system default programs and combis are persistently-stored in permanent system ROM, but there is only one location for each of these data types and these single locations can be overwritten by some 3rd-party sound sets. In some cases, this could cause even some of your system default programs and combis to stop working correctly (until you restored the defaults). The bottom line is that unless you develop some good strategies for dealing with your M3 data management, you might eventually get nailed by some of these challenges and possibly lose some important data. One possible strategy is described in Korg M3: Best practices for installing 3rd-party sound sets, which can give you ideas for developing your own best strategy. Strive to move your PROGRAMS around as little as possible, instead focusing on wholesale swap-outs of program banks U-F and U-G. This means you have to think about where your different related groups of programs should "live" when they're loaded in the M3. Remember that all you really have to work with are program banks U-F and U-G (and maybe I-F if you don't have an EXB-RADIAS), because there is system default data in all the other program banks. Important: if you have an EXB-RADIAS card installed in your M3, you should also create an empty RADIAS program bank too (typically program bank U-F is best for this, to be parallel with the Korg RADIAS preload data in program bank I-F), then save that empty bank in your special PCG file too. The idea here is that you want an empty RADIAS bank and and empty EDS bank in your special PCG file. (The original author of this article uses empty program banks U-F and U-G for the RADIAS and EDS programs, respectively.) If you're not sure which of your user program banks are assigned for RADIAS programs, go to GLOBAL mode, then to the P0:Basic Setup page, then from the page menu in the upper right, select Set Prog User - Bank Type. Note: The M3 Editor also provides an easy way to clear out a combi or program bank if you are comfortable with using the M3 Editor. When you first start the M3 Editor, all of the banks in it are empty. Normally you do a Receive All in the Editor to pull all the combi and program banks from your M3 into the Editor. But if you simply select one of the initially empty banks in the M3 Editor and Transmit Bank it to the M3, it will overwrite the target bank on the M3 with the empty bank from the Editor. When creating a PCG file to save some banks to external media, you should generally also include the following data in the PCG file, because some other PCG file that you load (especially from some 3rd-party sound sets) might overwrite this data and you'll need a way to restore it. The user drum kits currently in your system. The user drum patterns currently in your system. All sampling data that you create for use in your programs and drumkits must be meticulously saved to external media before turning off the M3, and then carefully reloaded with the correct options to ensure that the objects that use this sampling data are able to find the correct multisamples and samples. Go to the Save tab. From the page menu, select Save PCG. The Save PCG Data window appears. In the To field, touch the T icon and specify a meaningful 8-character name for the PCG file that you're about to save. In the Program section, touch the Selection icon and in the resulting window touch the Nothing icon to clear all of the checkboxes. Select the checkboxes for each program bank that you want to save to this PCG file, then touch the OK icon. Repeat this process for the Combination and Drumkit sections. Uncheck the Global Setting checkbox, because you generally do not want to overwrite your global settings. Note that it's generally a good idea to have one PCG file that contains your global settings in case you ever need to restore them. Note that many people will probably never customize the system default formant motions or add new ones, but there might be some 3rd-party sound sets that will overwrite these. You can restore the system default formant motions with the GLOBAL Load Preload/Demo Data command, but if you've created custom formant motions then you need to back them up along with the programs that use them. You can also save about 40 seconds when loading the PCG file if you don't need to back up the formant motions. (optional) Select the Drum Track User Pattern checkbox. If you've created custom drum patterns then you need to back them up along with the programs and combis that use them. Touch the OK icon. The PCG file is created and saved on your external media. Go to the Load tab. Select the .PCG file that contains the bank(s) that you want to load. This might require "drilling into" some folders by selecting them and touching the Open icon. Touch the Load icon and then touch OK. This approach will not present you with any option to choose a different destination for the contents of the PCG file, so you should be very certain you know what will get overwritten on the M3 if you do this. Now "drill into" the selected PCG file by touching the Open icon again. This displays items representing the programs and/or combis stored in the PCG file. But you're not done yet! Drill further into one of these items by selecting it and touching Open again. At this point, you should see items representing each program or combi bank, with names like Bank U-G. If you select a specific bank item and touch the Load icon, you will load that entire bank after being presented with a window that enables you to choose a different destination bank to overwrite, if you prefer. If you drill down one more level (by selecting a specific bank and touching the Open icon), you can select a specific program or combi and touch the Load icon. This will present you with a window that enables you to select both a different destination bank and/or a different destination slot within that bank. After selecting your destination bank and/or slot using these two techniques, and touching the OK icon, the M3 will briefly display Writing to internal memory while it overwrites the specified destination. This is a complex subject that merits its own article. See Korg M3: Understanding and working with sampling data for more information. This is a complex subject that merits its own article. 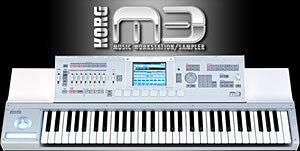 See Korg M3: Understanding and working with sequencing data for more information. Loading a PCG with only programs, combis, drum kits, user drum patterns, and global settings is relatively fast, usually taking around 5-15 seconds depending on how many banks you are loading. Loading RADIAS formant motions adds about 40 seconds to the loading process. Loading a nearly full set of sampling data to the 64MB internal RAM can add anywhere from 30 seconds to roughly two minutes to the loading process, depending on the total number of multisamples and samples that are being loaded (more takes longer). Scenario : You've loaded a .MID file, but the voices being played back do not correspond to what the file originally had. 1. Changes can occur is because Korg banks go 0 to 127, GM goes 1 to 128. 2. There is an embedded program change in the track that is altering your chosen voice. 1. Go to Global Mode > System Pref and change the Bank Map to "GM2" instead of Korg. That might work. 2. Otherwise, go into the track that is playing the incorrect sound with the Track Edit Page > Menu Button > Event Edit. Checkbox only the Program Changes when the dialog comes up, and you should be able to easily see any program change info that is stored on the track. Just delete it. Then you can set it to whatever you want in the track itself, and it will stay that way. 3. If you want to change your sequences to play the Korg internal timbres rather than the GM bank ones, you need to edit your midi files usually by deleteing the first measure of each track which normally contains the program change instruction that selects the GM sound (as described in step 2. above) , then select the right sound for each track in the P0-1 screen, then save as a .SNG file for future.